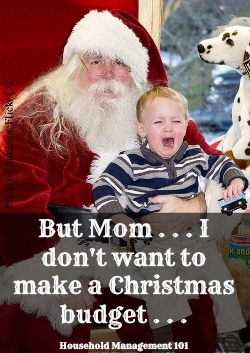 Making a Christmas budget, especially for the first time, can be daunting. Here are a couple videos that help break the steps down for you, to make it easier. Do you feel like this little boy in the photo when someone tells you that you should make a budget for your Christmas shopping and other expenses this year? You don't have to once you break the process down into easy steps. I've already discussed why you should have Christmas on a budget. The main reason, of course, being that it is the best way to ensure that your holidays are stress free, and to make sure you start your New Year's right, without going into debt for a couple of days of fun. A holiday budget doesn't mean a fun-free Christmas, but just a fun holiday that you can afford, and will not regret later. In addition to following my suggestions for making your holiday budget (which includes a free printable form you can use to create your own), I found these helpful videos on budgeting for Christmas that I thought you might enjoy. So sit back, and relax, and watch them to get some tips and ideas for making your own Christmas budget this year, and for years to come. The first video in the series discusses making a holiday spending worksheet. It lists all the categories you should consider when making your budget, from the obvious to the only obvious once you think about it categories. Of course, each person's holiday celebrations and traditions are different, so feel free to add and subtract from the categories as needed to personalize your budget for your family's plans. After you have created a Christmas budget with all the categories, saying what you anticipate spending you still need to stick to it. There is no point in making a plan unless you actually follow the plan. However, you know that plans don't actually work out exactly like we want because life happens. You can overspend on a gift because it cost more than anticipated, or find a great sale and underspend too. Tracking your holiday spending is the topic of this next video. It suggests using a worksheet for the gifts you buy, and tracking both what you anticipated spending, and then what you actually spent. Then, you can see how close you are keeping to the total budgeted amount based on where you went over or under budget. To help you with this I have created a printable Christmas gift list that you can use to help you both keep on budget, and organize your gift shopping, making, and wrapping this year. Remember too, that tracking your spending should be done for all areas of your Christmas budget, not just the gifts you buy. That is just what is used in the example. I hope these tips on creating and using a Christmas budget will help you this year. Remember to keep past years budgets in your household notebook so you can reference them again in the coming years. If you track everything you spend, whether anticipated or not one year, the next year's holiday budget will end up being much more accurate and predictable, and also much easier to do because you will most likely do many of the same things again.